Yesterday, Ekovest came out with a long well crafted filing for its sale of 40% of DUKE Expressway, and when I asked my dealer on whether there are any analysts that provide report based on the filing made - I guess most analysts went home early, more interested into deciphering the US election than looking at the long-winded filing(please read them if you can) made by Ekovest. Ironically, the dealer of mine passed me an article and that article is this. I did not know they follow me too. Hence, I decided to write another one. In deciphering the entire purpose of the company and what they intend to do, I would say Ekovest's management have been very fair to its shareholders, thus far. This is in considering that it is the type of management that is able to get into Iskandar Waterfront and Bandar Malaysia projects. They have done well in this respect. What's important in this filing? 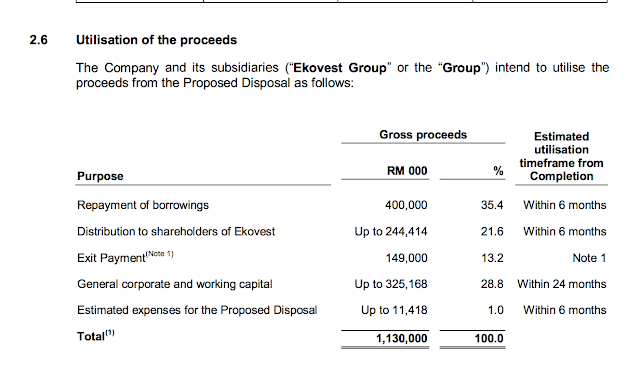 I guess I do not have to explain this much but upon completion of the deal with EPF, Ekovest will pay 25 sen per share of dividend to its shareholders that hold the parent share (now RM2.35). This includes those warrant holders that have exercised the shares into parent within certain allowable timeframe. 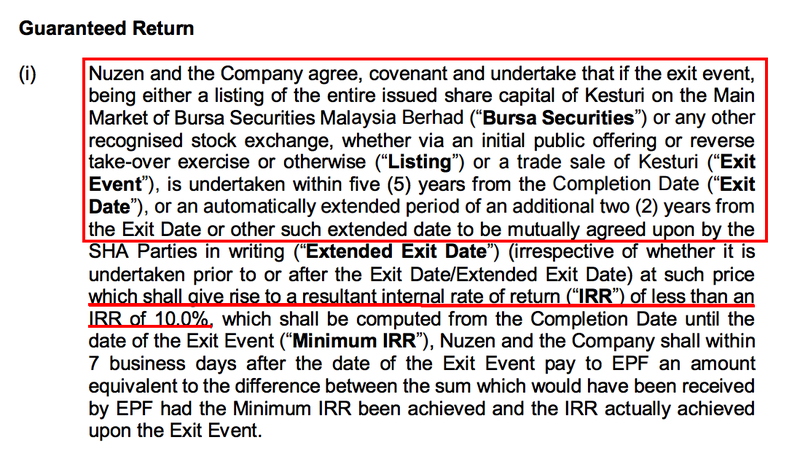 Few things to note, based on below (if I am not wrong), even if you hold the warrant the warrantholders will not lose out as its exercise price will be adjusted accordingly after the dividend payment. Also the share split which I will discuss in the next point, the warrants will be equally split as well. Do also take note that from the sale valued at RM1.13 billion, RM244 million will be distributed as dividends while RM400 million to repay borrowings. The rest are for working capital and other purposes such as fees. 3. Exit via IPO, trade sale etc. This item 3 is the most important and one which we have yet to see prior to this. (I DO expect good dividends, prior to this announcement). 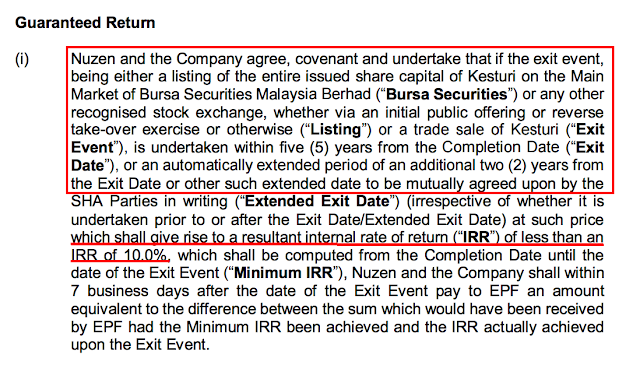 To cut things short, basically there is a guarantee of 10% IRR to EPF for the next 5 + 2 years. (EPF has protected itself well - so everyone thats working should be happy). If Ekovest does not achieve the intended target, it will have to pay EPF the difference through the monies that are allocated under the escrow account (RM149 million). The whole negotiation as I see it is to find another place for the highway asset - most probably IPO (see below). I would say that itself will allow shareholders of Ekovest to benefit from the dis-entanglement exercise. Most shareholders, I presume would prefer a direct exposure to the highway assets as compared to now park under Ekovest, the holding company. For me, this is the most important element in the entire filing as it inherently explain the intentions of the organization in discussion with EPF. I have mentioned of the intrinsic value of Ekovest. It depends on whether the management will want to surface them and allow shareholders to participate. In some events (cases like Tradewinds Plantations, old Maxis, Mamee example), the major shareholders wanted to take most of the value by privatising their controlled companies. Seriously, I was concerned that it could have done that as the shares was trading at around RM1.00 - RM1.30 for some time. With this exercise, I am convinced of the company even more, I should say. I am not sure about the warrant price to be adjusted. I think it is more like they will adjust the price after the split I think? I am not sure as well :D I hold quite a bit of ekovest wb and mother as well. 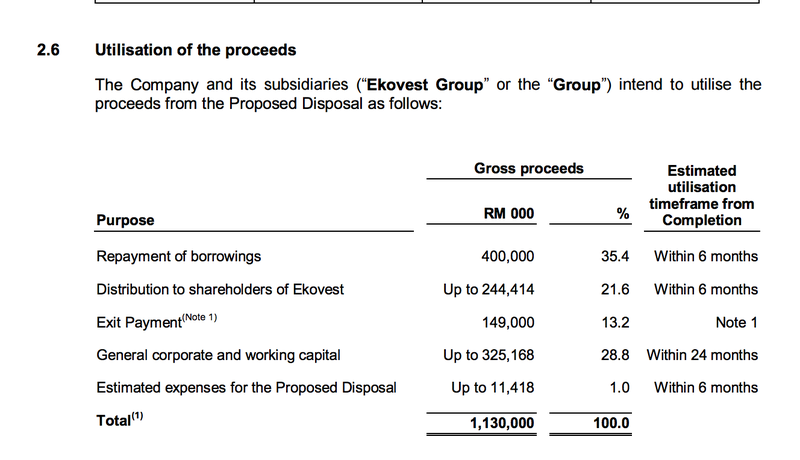 Special cash dividend of 25 cents will not dilute the value of Ekovest warrant. 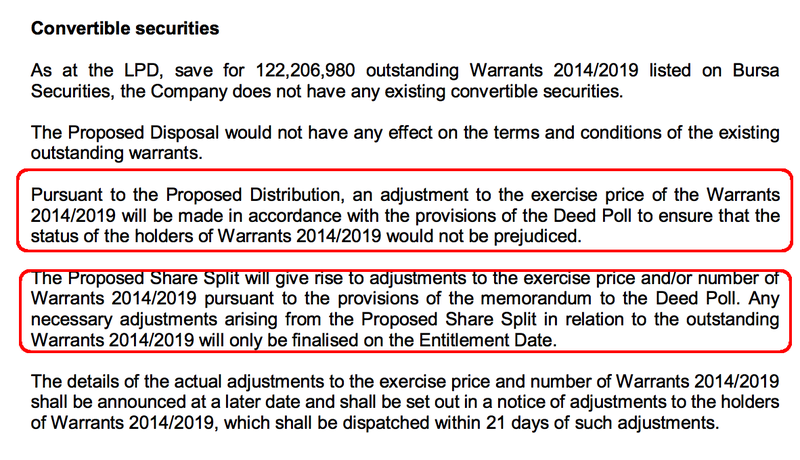 Based on previous practice of declaring special dividend by other companies (Sunway Bhd & Tanjong Offshore), the exercise price of the warrant will be adjusted accordingly. Based on my calculation & existing prices of mother (RM2.50) & warrant (RM1.37) shares, the new exercise price will be RM1.22, revised from RM1.35. Thanks, Money Sifu. I guess I am wrong. Thanks a lot.